Acuity Brands launched two OLED luminaries, the company's first. The two new products (called Kindred and Revel) are designed for indoor, ambient applications. Planned availability is Q1 2012. 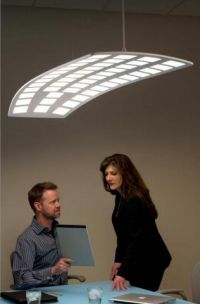 The company will show the new OLED lighting products at the LightFair International 2011 Tradeshow and Conference (May 17-19, 2011). 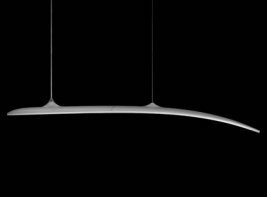 The Kindred (shown above) is contemporary-styled lamp and it's "engineered to provide a room with individualized canopies of light, blurring the lines between architecture and lighting". The Kindred includes 45 OLED panels that output 3060 Lumens at 58 Watts (53lm/w). The lifetime is 15,000 hours (L70). 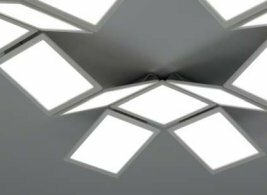 The Revel, inspired by the organic shapes of flowers, is a lighting system that gives designers the freedom to create lighting patterns tailored to their unique application. Each Revel Module includes 5 OLED panels offering a total of 314 lumens. The efficiency is 48 lm/w and the lifetime (L70) is 15,000 hours. According to Acuity Brands product brochure (update: the brochure has been taken offline), LG Chem is providing the OLED panels. LG Chem announced their OLED lighting product plans back in 2009. Back then, LG Chem planned to use green and red PHOLED materials made by Universal Display, and SFC's deep-blue fluorescent OLED. 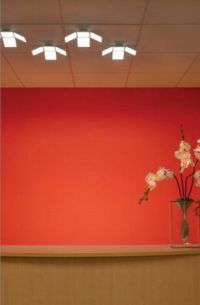 UDC is also collaborating with Acuity Brands to develop color-tunable OLED lighting panels.